BinaryBrokerz committed to providing traders with professional guidance and tools for mastering and successfully trading binary options. Established in 2014, BinaryBrokerz aims to provide traders with the best trading conditions possible. The broker is owned and operated by a company called Europe Ridge Ltd, which is registered in Bulgaria. It also has offices in Limassol, Cyprus. Importantly, each customer is treated as a separate individual with different needs and expectations. The immaculate level of personalized service present at BinaryBrokerz is something hard to find elsewhere these days. In other words, they are really fulfilling the very purpose of establishing this brokerage house. Starting trading with BinaryBrokerz is simple and straightforward. After filing a simple form on the broker’s website, and the information is validated, you’ll start experiencing the unique conditions offered by BinaryBrokerz. Interestingly, the submission of the account opening form will immediately prompt the attention of a personal manager who will give expert financial guidance, tailored to meet your individual financial goals. BinaryBrokerz also offers a free demo account loaded with $1,000 virtual money to assist in perfecting your trading skills. Recognizing the diversified needs and interests of customers, BinaryBrokerz offers different account types, which are described below. Basic: It requires $250-499 for opening and maintaining this account. It comes with a free eBook, daily market reviews, live support, and video courses. Bronze: It is maintained with $500-999. Notably, it offers a bonus of 35% and comes with a dedicated junior manager. 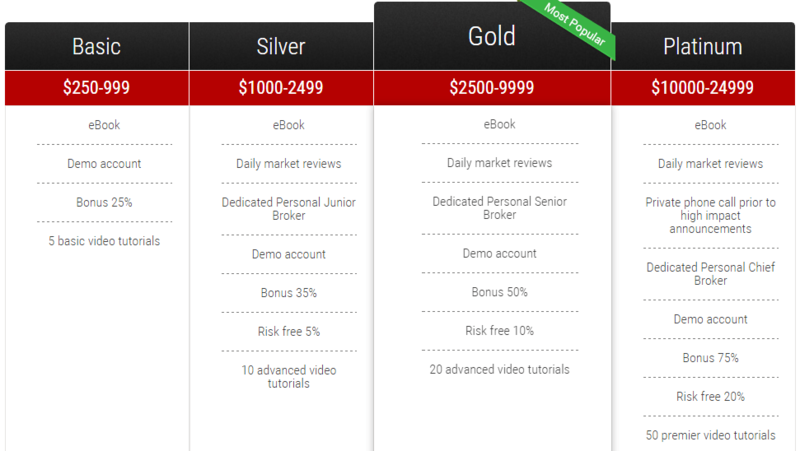 Silver: It is the most opted-for account type, and requires $1,000-4,999. It offers a bonus of 50%, along with other exciting benefits. Gold: Suited for serious traders, this account is maintained at $5,000-9,999. It offers a bonus of 75% plus other better features absent in other types. Platinum: It is the highest-level account, and requires more than $10,000. You’ll get a whopping bonus of 100%, if you opt for it. Islamic: It is suited for traders looking for conditions compliant with the Shariah Law. Deposits and withdrawals at BinaryBrokerz are very convenient and simple. Payments can be made in five different currencies (USD/CAD/AUD/GBP/EUR) using the major credit cards, e-wallets, or wire transfer. Importantly, every transaction is carried out in an easy manner without any delays. Moreover, the payments are completed using highly secured protocols. BinaryBrokerz offers a highly effective, convenient, and informative trading platform. Besides the web-based platform, the broker also offers a mobile platform, enabling limitless trading from anywhere. The platform has been powerfully built for speed, precision, and maximum security—enabling traders to execute instantaneous, accurate orders, which can make the difference between a massive loss and a massive return on investment. It seems the team at BinaryBrokerz has realized that most successful trading decisions are based on several factors, and one of them is accuracy. Therefore, the broker offers real-time advanced charts, signals, and indicators that provide traders with an ideal environment for analysis and performance monitoring. The trading platform has more than 100 financial assets, including all the major currency pairs, commodities, stocks, and indices. 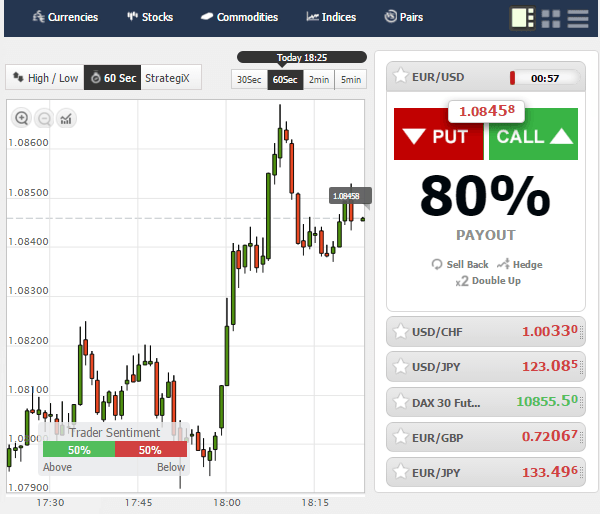 The main types of binary options available for trading are Classical, Short-Term, Boundary, One Touch, and Tunnel, with payouts of up to 92%, or even higher. Furthermore, if you do not have a strategy of your own, you can use the platform’s social trading feature to copy the winning strategies of other successful traders. Customer service at BinaryBrokerz is absolutely outstanding. The turnaround time for reply to queries, which is done via live chat, phone, or email, is amazing. The customer support team is knowledgeable and eager to serve customers. More so, the broker runs a comprehensive education center in which each customer gets a dedicated manager, who provides a one-on-one assistance, along with other helpful education materials, for profitable trading. However, the only drawback we noticed is that customer service is available only in a handful of languages. Our review of BinaryBrokerz has revealed that it is doing a good job, and its high reputation in the industry has won the confidence of many traders around the globe. So, if you are looking for a broker that emphasis on a personalized approach to trading, together with providing other quality services, then BinaryBrokerz could be the right fit for your needs.